Crescent Decorative Flannel Texture Matboard has a textured surface, lightly flecked with variegated color. Individual boards are 4-ply, and measure .052" – .060" (1.3 mm to 1.5 mm) thick. Sheet sizes are 20" × 32" (51 cm × 81 cm) and 32" × 40" (81 cm × 102 cm). Some colors are only available in one of the two sizes. 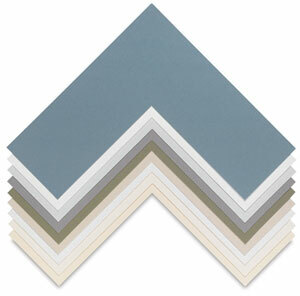 Crescent Decorative Matboard is suitable for the vast majority of matting and framing applications. Where archival quality is needed, for fine art originals, valuable documents, limited edition prints and photos, and so forth, we recommend an archival grade such as Crescent Museum Grade matboard.